Why are tennis players getting older? The answer may not be what we think. A few weeks ago, 31-year-old Rafa Nadal beat 31-year-old Kevin Anderson in the final of the men’s US Open — the third Grand Slam final of 2017 to feature two players in their thirties. 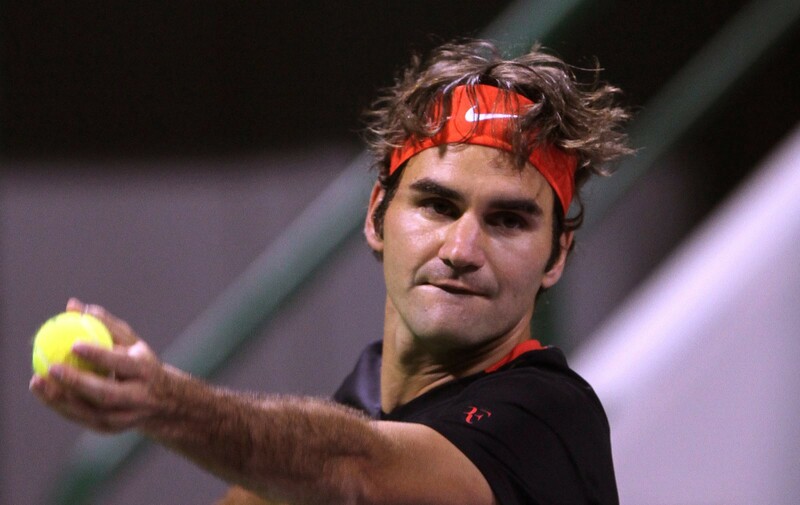 There’s no getting around it: tennis players are getting older. Or to be more precise, the average age of the players at the top of the game is increasing, and has been for a while. This has been commented upon in numerous articles and blogs. The Economist recently calculated that the average age of the top 100 men’s players increased from 24.6 in 1990 to 28.6 in 2017. On the women’s side the average age of the top 100 increased from 22.8 to 25.9. 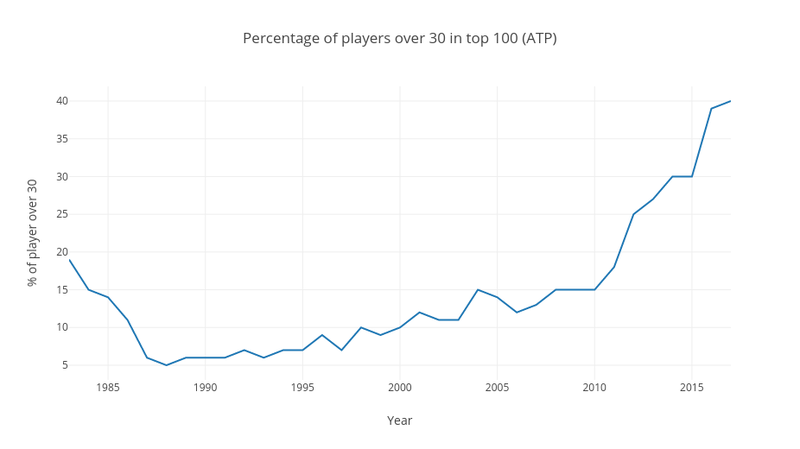 The proportion of players in the top 100 men who are over the age of 30 has soared from 6% in 1990 to 40% in 2017. But while this trend has been much observed, it has been little explained. The Economist article gestured vaguely towards improvements in “sports medicine and racket technology”, but surely the incremental improvements in these technologies can’t explain such a dramatic trend? So is there another explanatory factor? Or is there more to the story? The results are striking. 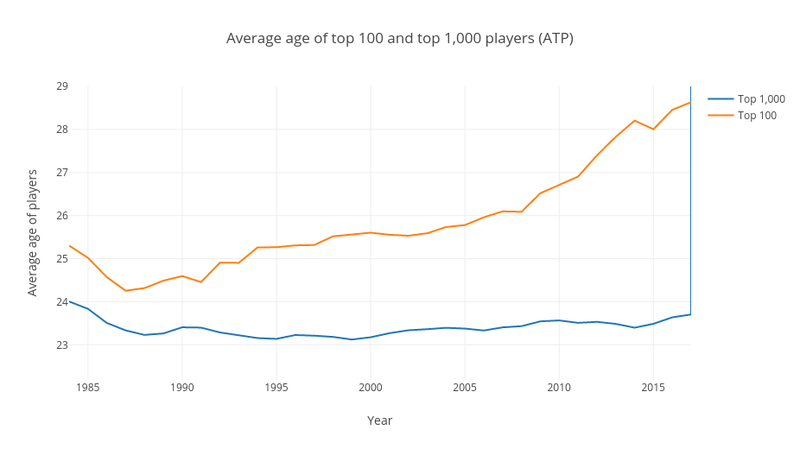 While the top 100 men may have been getting older over the past 30 years, the average age of the top 1,000 players has barely shifted, hovering between 23 and 24. 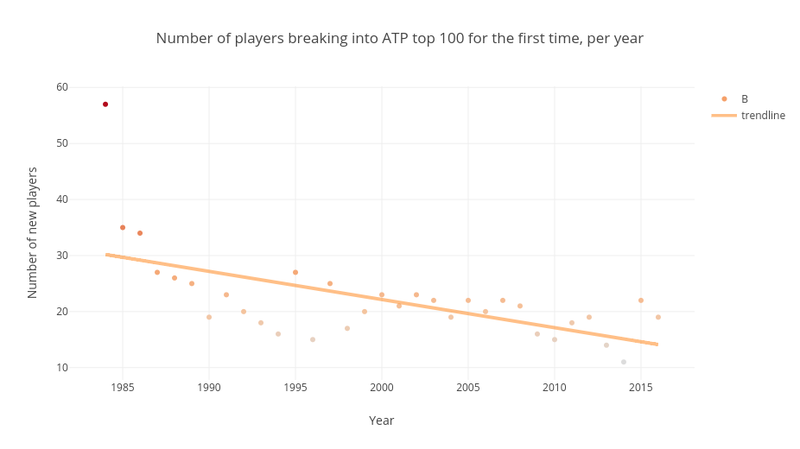 So the ageing trend appears only to affect the very top players. 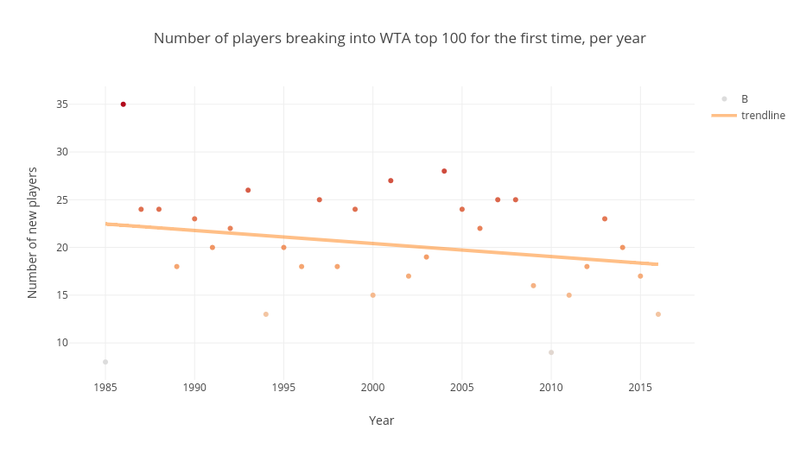 And the trends are remarkably similar in the women’s game — very little change in the average age of the top 1,000; a steady increase in the average age of the top 100 over the past 30 years; and a sharp spike in the average age of the top 10 over the past decade. At this point, we can throw out the theory that improvements in racket or string technology are behind this trend. There is no magical racket that Rafa Nadal and Serena Williams can get hold of but the world number 300 can’t. Likewise, we can dispense with another theory — that we have been living through a ‘golden generation’, during which a handful of exceptional players have dominated and are now reaching the end of their careers and skewing the average age up. The Big Four may have distorted the data a little on the men’s side but the broader trends are clear and consistent across both the men’s and the women’s game, and, with the exception of Serena Williams, the women’s game in the last decade has been characterised by how much flux there has been, rather than by dominance of a few top players. So another explanation is required. 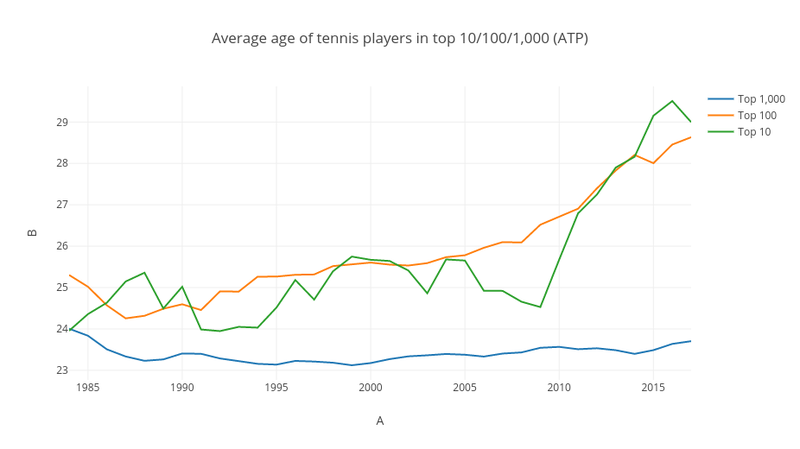 Why have the upper echelons of tennis become increasingly dominated by older players in the last 10 years, while average ages outside the very top level have remained unchanged? Or, to be more specific again, income inequality. Over the past decade or two, the amount of the money sloshing around the very top of the game, in terms of both prize money and sponsorship, has risen exponentially. The total Wimbledon prize pool has gone from around £1.5 million in 1984 to £31.6 million in 2017 (in 2017 prices). Roger Federer earned $60 million in endorsements alone in 2016, making him the fourth highest-earning sportsperson in the world. But while the tennis has become wildly lucrative for those at the very top, the effects have not been felt further down the rankings. FiveThirtyEight observed a couple of years ago that prize money on the Challenger circuit had actually been falling year-on-year. In the same article, they estimate that only the top 336 men and 253 women are making a profit from playing tennis. Travelling with your own coach, which a casual tennis watcher might assume is de rigueur for all pro players, is actually a luxury that only the top 100 or so players can afford. In a Forbes feature on income inequality in tennis, the 92nd-ranked male player describes searching for budget hotel rooms and adopting a ‘bootstrapper mentality’ to make ends meet. Meanwhile, Roger Federer travels with two coaches, a physiotherapist, a fitness trainer and an entourage of other support staff that includes nannies and teachers for his children. Novak Djokovic sleeps in hypobaric chambers. Andy Murray subsists on a bespoke diet, constructed by his personal nutritionist, that includes 50 pieces of sushi a day. This is all part of the professionalisation of tennis over the past 30 years. In the early 1980s John McEnroe dominated the game without employing a coach, and only in the twilight of his career did he reluctantly accept that his prospects of winning could be improved by doing some physical training. But then, he ‘only’ won £100,000 for his 1984 Wimbledon title (approx £265,000 in today’s money). As the amount of money on offer has grown, the level has risen and the hunt for a competitive edge has grown ever more wide-ranging, with each marginal gain becoming more difficult, and more expensive, than the last. My suggestion is that the combination of hyper-professionalisation and the massively lopsided distribution of wealth within the game has led to a situation of entrenched inequality, which is manifested in the ageing trends of the top players. 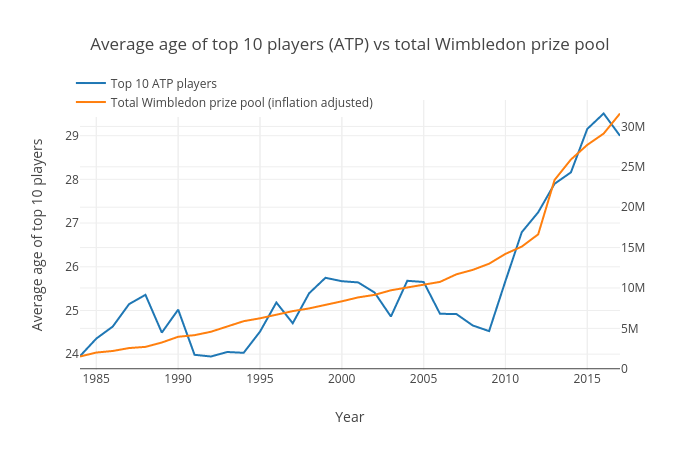 The graph below shows how the total prize pool at Wimbledon has increased since 1984, plotted against the average age of the top 10 men. The increasing dominance of older players correlates closely with the increasing rewards on offer for those at the very top of the game. There is a marked downward trend in both the men’s and women’s game, showing that there is less movement in and out of the top 100. 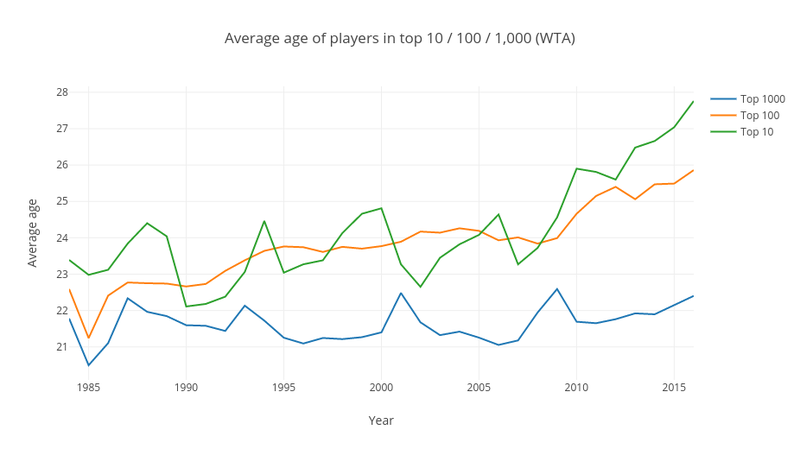 So actually, ‘the top players are getting older’ doesn’t tell the full story. It would be more accurate to say: ‘once players get to the top, they are increasingly likely to stay there, and stay longer’. Put even more bluntly: the players who get to the top appear to be kicking the ladder away beneath them. The players who get to the top increasingly appear to be kicking the ladder away beneath them. The data point to the existence of an income threshold, or series of thresholds, in tennis. When a tennis player starts earning over a given amount, they reach a kind of escape velocity and can propel themselves into the rarefied air above the struggling masses below. Once there, they can cement their place by paying top dollar for all the thing that the lower ranks can only dream of — full-time coaching staff, fitness trainers, nutritionists, medical advisors and personal doctors, first class flights, six star hotels, the list goes on — and prolong theirs careers and their time at the top far longer than used to be possible before the hyper-professionalisation of the game, and the explosion of money at the upper end. And of course, it’s not just about stuff that you can immediately buy. Having money changes your psychology — how much harder is it to serve out a match when your livelihood depends on doing so? — and your whole approach to the game. Roger Federer can calmly take six months off tennis to make sure a knee injury is 100% repaired and rehabbed, his only concern being the impact on his career-end trophy tally. But if you need the prize money from your next tournament just to keep on the tour, you’re much more likely to ignore that niggle in your knee, much more likely to get a chronic injury, much more likely to end your career early. Does it matter, and can anything be done? If you care about a level playing field in sport, and you want to see sport played to the highest possible standard, this should be a cause for concern. The unavoidable implication is that there may be players outside the top 100 who have just as much talent and potential as players in the top 10, but who will never get their opportunity to ascend to that level because of the way money is distributed within the game. It’s hard to think of an obvious cure. And the motivation to look for one is fairly weak, not least because the disease is lacking in any visible symptoms. The men’s side of the game has enjoyed a remarkable decade in terms of quality and entertaining rivalry. Ticket sales and television revenues for the top tournaments go from strength to strength. The game appears to be in rude health. The costs to us in terms of unfulfilled potential are invisible. Fortunately, though, the ATP appears to be aware that there is an issue, and is in the middle of a two-year investigation into the distribution of prize money within the game. The driver for the investigation may be anxiety about life after the Big Four on the men’s side, but hopefully this will just be the precipitating factor that prompts a deeper examination of the economics of the professional game, and some innovative proposals for allowing talent the opportunity to prove itself. All the data above came from Jeff Sackman’s repository. Massive thanks to Jeff, and general props for all the brilliant data gathering and analysis he does on tennis over at www.tennisabstract.com. *There are occasional spots where the data are incomplete. There are some players for whom no birthdate is available, and in some of the earlier years in the 1980s the rankings only go down to 300 or 400, rather than the full 1,000+. This doesn’t affect any of the graphs or conclusions in any significant way. Some-time editor. Economics student. Tennis and cricket fan. Nerd.